Looking for a tasty entrée? This restaurant-inspired main dish salad features crisp greens, shrimp and quinoa, a versatile and quick-cooking grain that adds great texture. 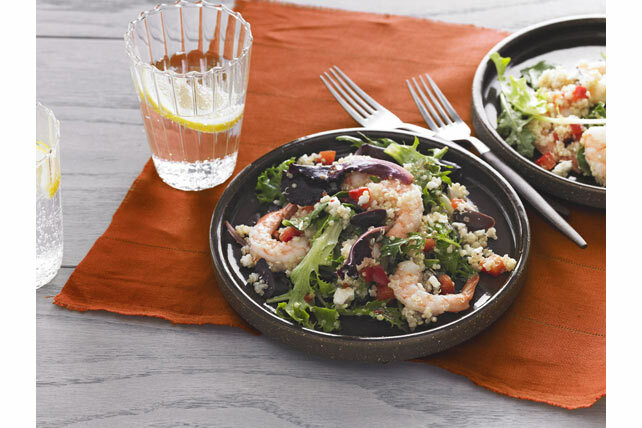 Our Quinoa & Shrimp Salad is a must-try recipe! Cook quinoa as directed on package; spoon into large bowl. Let stand 5 min. Stir in all remaining ingredients except salad greens. Add salad greens; mix lightly. Salad can be made ahead of time. Prepare as directed except do not add salad greens. Refrigerate up to 4 hours. Add greens just before serving; mix lightly. Prepare using KRAFT Extra Virgin Olive Oil Aged Balsamic Vinaigrette Dressing.